Pet Assistance Foundation (PAF) welcomes you to our caring family. We are advocates for responsible pet care and spay/neuter assistance through education, referral services and subsidy for low-income pet owners. PAF was founded in 1955 by a group of women who realized that pet overpopulation is the root cause of companion animal suffering. While there were other non-profit humane societies in Southern California founded in the mid decades of the twentieth century to address companion animal suffering, our founders knew there had to be at least ONE organization dedicated to addressing pet overpopulation. We are, indeed, true pioneers in the field of spay/neuter advocacy. PAF is unique in another respect. We are one hundred percent grassroots. While we first set roots in Central and Northern parts of Los Angeles, many additional branches sprang up throughout Southern California since our founding. Caring volunteers saw the need in their respective communities to address animal suffering caused by pet overpopulation. They could not help but be struck by the relentless “fallout” of pet overpopulation—the “free puppy and kitten” signs and ads, abandonment, strays in the streets, animals passed from one bad home to another, and the high euthanasia rates in the shelters. These volunteers devoted themselves to running a PAF Branch to principally operate a local spay/neuter hotline; however many plunged headlong into rescue, humane education, volunteering in local shelters and promoting humane legislation as a result of what they witnessed in their communities, as well as their experiences on the Branch hotline. Many of these early volunteers are now deceased, but they left a legacy of commitment to the animals at a grassroots level. PAF still operates pretty much in the same vein as it did decades ago. With the exception of a part time office manager, the greater part of our mission is entirely carried out by volunteers. Our funds go directly to helping the animals. I have served as PAF a volunteer since 1969 when, as a young teacher in an inner city Los Angeles School, I became involved in rescuing the many strays on our campus. Initiated into the fold by our school secretary, a PAF Board member, I felt a sense of relief that at least there was an organization addressing my almost daily encounter with animal suffering caused by pet overpopulation. 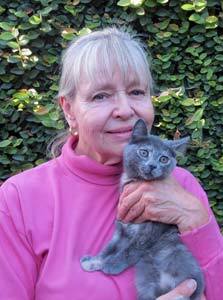 I have since dedicated my life to spay/neuter advocacy, humane education, rescue and adoption, and legislative reform.